Applications are now open for 2019 class, deadline is 31st May, 2019. A lab built experimental setup to demonstrate hydroelectric power generation.  Interview with Lesotho Television regarding MSc in Sustainable Energy that is currently ran by NUL ERC (https://erc.nul.ls/). The Honourable Monyane Moleleki gives a comment during a Wind Energy Workshop held at NUL in 2010. Major energy stakeholders attended the workshop. A micro wind turbine designed and built by a final year BEng student, Lerato Chapile. Currently used as lab practical experiment for wind energy students. The Lesotho Meteorological Services wind measuring mast at Lets'eng in 2009. ERC held an Open Day to publicise its MSc in Sustainable Energy programme to the nation. Ntate Chaotsane presenting on powering the Vodacom base stations with renewable energy at the Wind Energy Workshop held at NUL in 2010.